Most of us have one place we can truly call home. 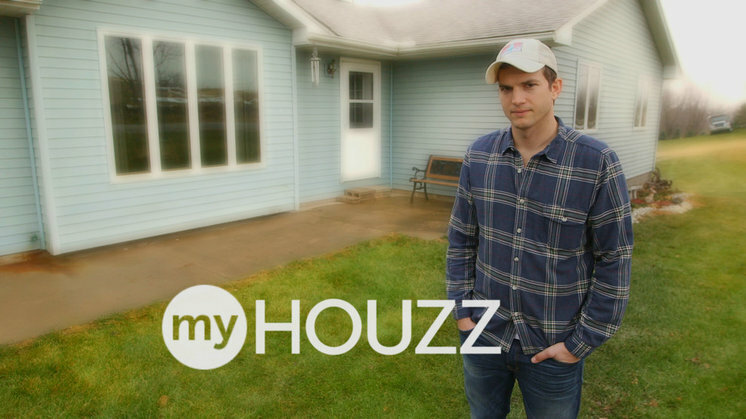 For actor Ashton Kutcher, that place is in Homestead, Iowa (population 148). This is where as a teenager he helped his stepdad, Mark, build the home in which he and his family lived when he was in high school. Ashton’s mom, Diane, and Mark still live in the home. Until recently, the house had a dark walkout basement with a windowless bedroom, unfinished storage space and a main living area filled with exercise equipment, several old recliners and John Wayne memorabilia. For many years, that’s where Ashton would stay when visiting. Diane had been wanting to renovate the space. So as a surprise thank-you gift for his mom, Ashton, with the help of Mark, secretly remodeled the basement with her in mind, establishing a more contemporary rustic vibe, relocating the bedroom to gain two windows and creating a more family-friendly layout in the main living area that includes display space for her antique collection. There’s now even a clever canning room for storing her famous homemade salsa. 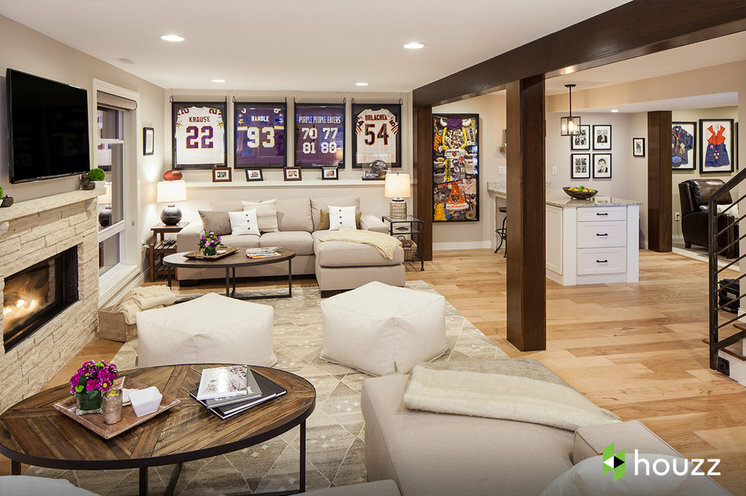 Given that he lives in Los Angeles and his parents’ home is in Iowa, Ashton, a longtime Houzz user and investor, used the Houzz app to renovate the space. He created an ideabook, found a local interior designer in Iowa — Catherine Thomas — and bought nearly all the new furnishings from the Houzz Shop. A camera crew followed Ashton, Mark and Catherine from the planning stages through construction. 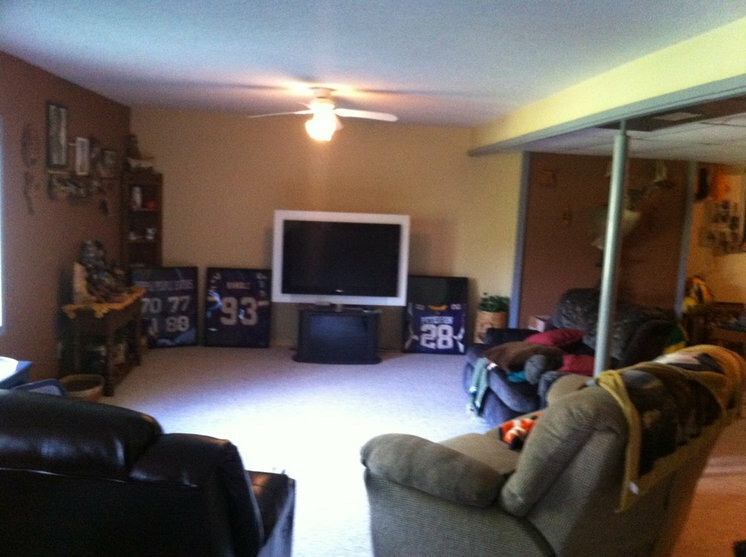 BEFORE: The basement had long been thought of as a secondary space, and with growing grandkids there was more function needed that hadn’t been anticipated. The TV area felt closed off and uninviting, especially to guests who came down the stairs to find themselves looking at the backs of recliners, of which there no fewer than five. Then there was the issue of the sports and Western themes. “It wasn’t organized or well-displayed. It was just overbearing,” says interior designer Catherine. Through conversations with Ashton and Mark, Catherine learned that Diane wanted to make the space brighter and more comfortable for family and guests, with lots of room for people to gather, enjoy food, watch sports, play board games around the holidays and more. AFTER: After gutting the basement — knocking down some non-load-bearing walls, relocating the utility room, rerouting ductwork and cleaning up the ceiling area — Catherine established smaller areas within the main living space that would accommodate more people. 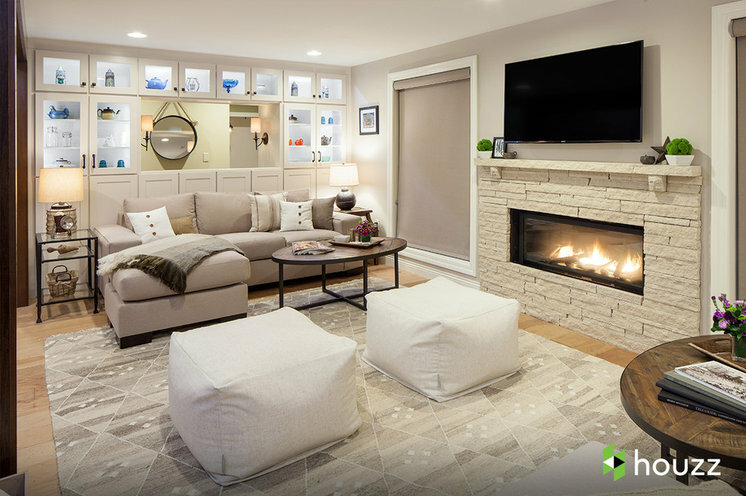 Two mirrored seating areas with a TV and fireplace in the middle now create a more open and welcoming vibe. All new lighting and two large windows flanking the fireplace help brighten the once-dark room. To create a look more in line with Diane’s style, Catherine set up a clean, natural and neutral backdrop for the couple’s possessions with a hint of traditional and rustic flair. There’s a lighter feel to the space thanks to the addition of linen by way of the sofa, cube pillows and lampshades. Catherine also updated the display of the sports memorabilia with smaller frames and a clear box for the football helmet that Ashton got his mom. The latter sits on a deep picture ledge beneath the jerseys. “We didn’t completely do away with their existing style but instead organized and enhanced all the design styles they were trying to achieve,” Catherine says. She wasn’t too concerned about placing the TV in such a high spot above the fireplace because this area is more about hanging out, playing games around the holidays and enjoying a fire. If the TV is on, most people will be viewing it from across the room at the large kitchen-style island, where guests can gather for snacks or to grab a beverage from the refrigerator below. The drawers store plates, glasses and silverware. The other half of the main basement area had been where Mark, a big John Wayne fan, displayed images of the late actor. “There was space available to be used, but there was so much going on it didn’t function as being anything in particular,” Catherine says. Now the room feels unified. Each seating arrangement can enjoy the TV and fireplace and gets a window to look through. A built-in display case shows off Diane’s antique collection, which was previously stored in boxes in a shed. “If Diane walked down at the end and it was all John Wayne stuff, we would have totally missed the target of what she wanted,” Catherine says. Mark’s photo collection found a home in a new bonus TV room nearby. Click here to see her reaction!